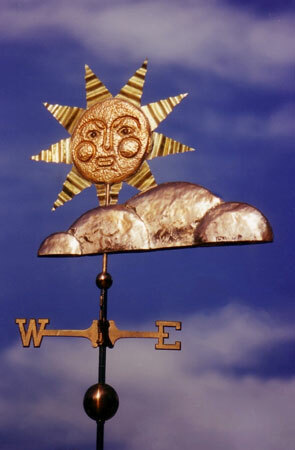 Our fiery Sun and Clouds Weathervane is one of our earliest designs. We live and work along the California coastline where a mixture of sun and fog is part of our daily life. 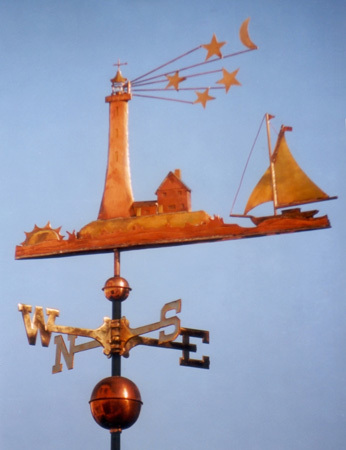 Along with sea otters, for which our area is also known, it seemed fitting to design some weathervanes celebrating this vibrant part of coastal living. 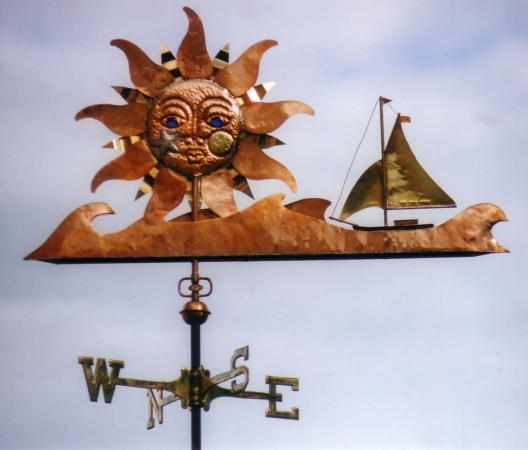 We typically make the Sun and Clouds Weather Vane in a metal combination of copper and brass to create subtle variations in the color of the metals as they go through the patina process. We can also add optional gold and/or palladium leaf to alternating rays of the sun, the face of the sun itself, and/or brush the tops of the clouds with silver colored palladium leaf. 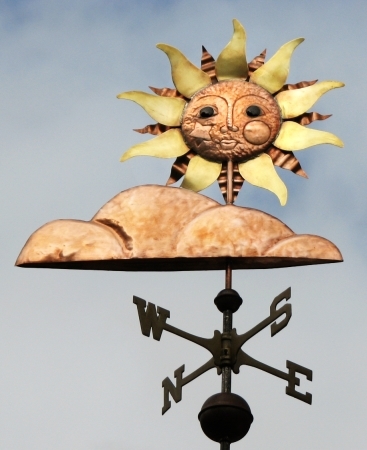 The sun in our Sun and Clouds Weathervane comes with translucent glass eyes. 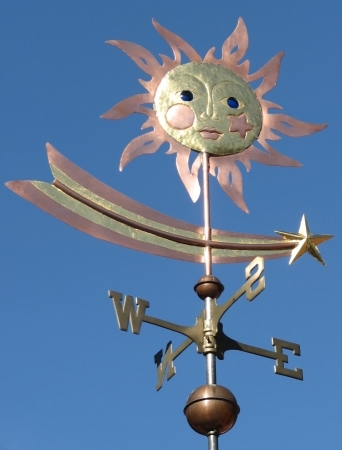 When you order this weathervane, you also get to choose its eye color. Popular choices are red, blue, emerald or topaz. 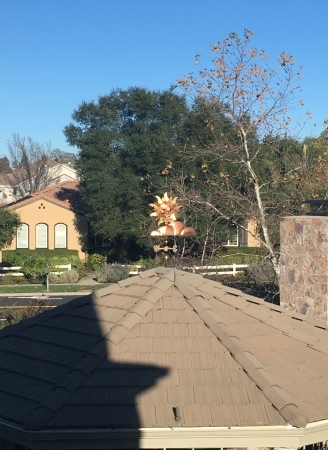 When the weathervane has been installed and is positioned between you and the sun, the eyes glow in the sunlight. The effect is quite memorable. Several other versions and sculpture pieces have evolved from this design as the decades have passed. 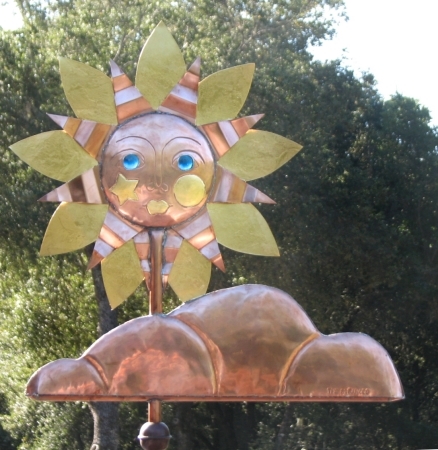 Some customers want us to fabricate just the sun itself, to be hung on a wall in their house or on their patio. 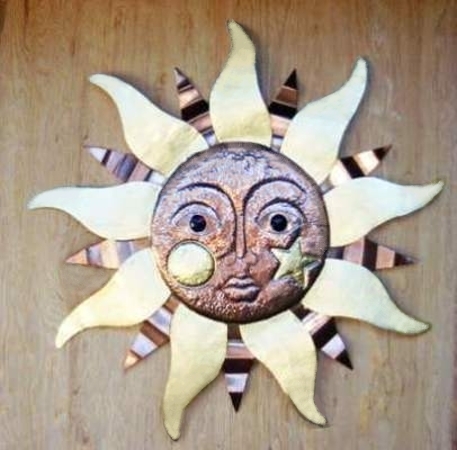 We have created a version of this design showing a gentle, beneficent sun face rather than this fiery face. 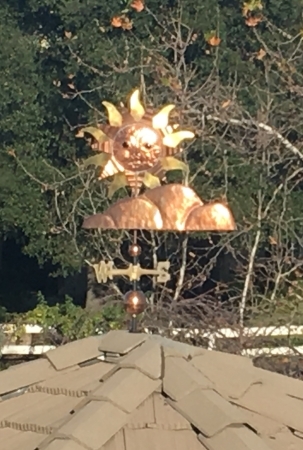 The sun shown here has also been transformed into a more astronomically oriented design we call the Sun, Moon & Comet Weathervane. And we have created a version in which the sun is sinking gracefully into the sea as a sailboat glides by. 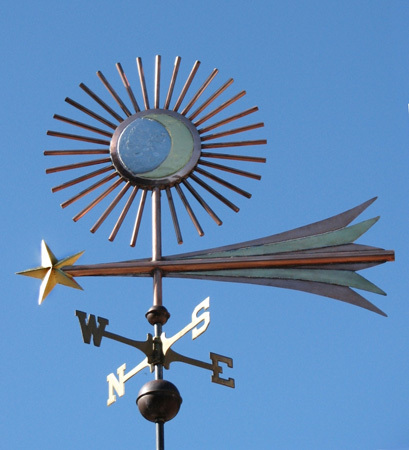 Our large series of Mythological weathervanes also features moon and star themes including a mighty Zeus Weathervane where he is hurling thunderbolts from the cloud tops, and over 50 other Mythological designs. 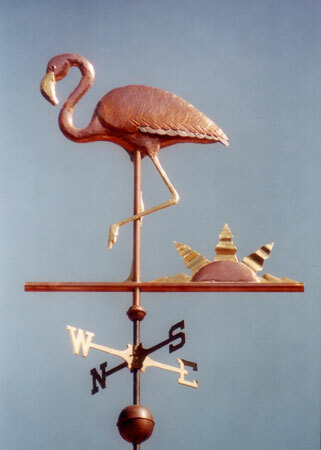 Please visit our Mythological Category webpages to learn more about our other mythological weather vane options.